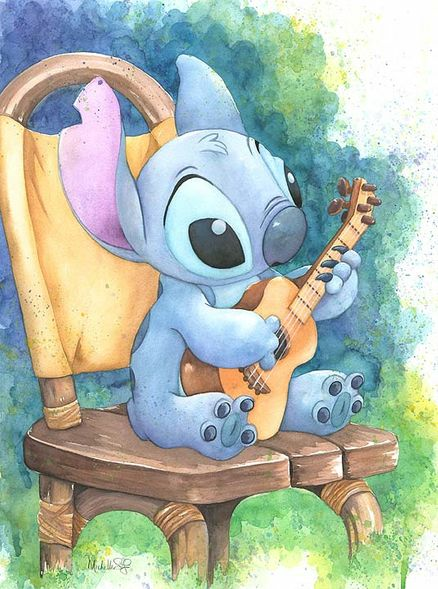 Michelle St. Laurent Signed and Numbered Hand-Textured Giclée on Canvas: "Ukulele Solo"
About The Artist:Michelle St.Laurent was born and raised in New Jersey, the oldest of four children in a large Italian family. At a young age, Michelle was inspired by Italian Renaissance painters Michelangelo and Leonardo da Vinci. She began painting at the age of 6 and asked for a new paint set on every birthday. In the first grade she entered a poster contest creating a painting of all the Disney characters marching in a parade. The judges disqualified her because they could not believe she had done the painting by herself without tracing. Her disappointment fueled her determination to become an artist. Filling many sketchbooks by the age of ten, Michelle began working with pastels drawing portraits of singers and movie stars. She won first place in a local art show and her piece was displayed in the town's City Hall. Michelle made it her goal to become a Disney Artist when her family moved to Florida at the age of 16. She worked in the Magic Kingdom throughout high school then attended the Art Institute in Ft. Lauderdale, majoring in Advertising and Design.